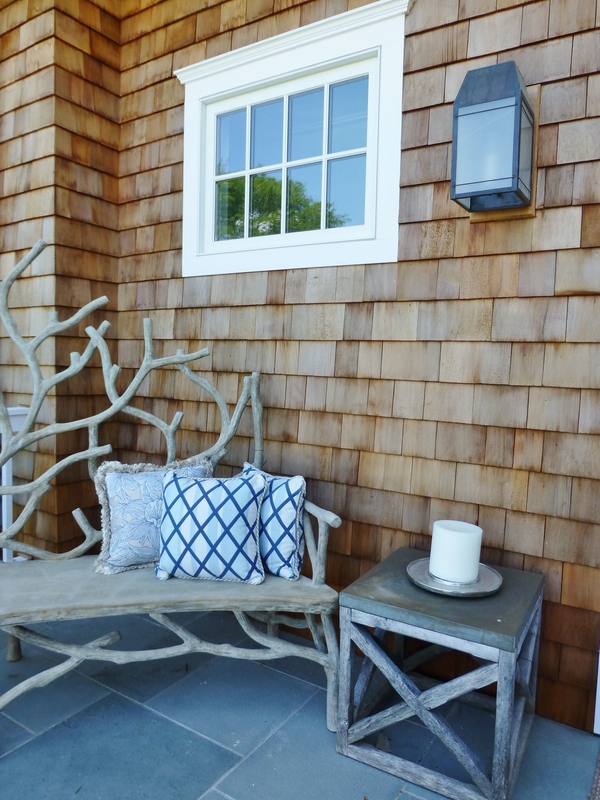 This stunning Faux Bois bench is featured on the Rear Landing Area designed by Mecox Design Services at the 2014 Hampton Designer Showhouse. Welcome back to Kristine Robinson’s Interiors…(and so much more!) I’m glad you joined me today for more of the 2014 Hampton Designer Showhouse tour. Last time, we ended up on the back terrace and swimming pool area of this amazing showhouse. Today, I’d like to share the rest of the back terrace areas with you and focus on the many comfortable outdoor living spaces. 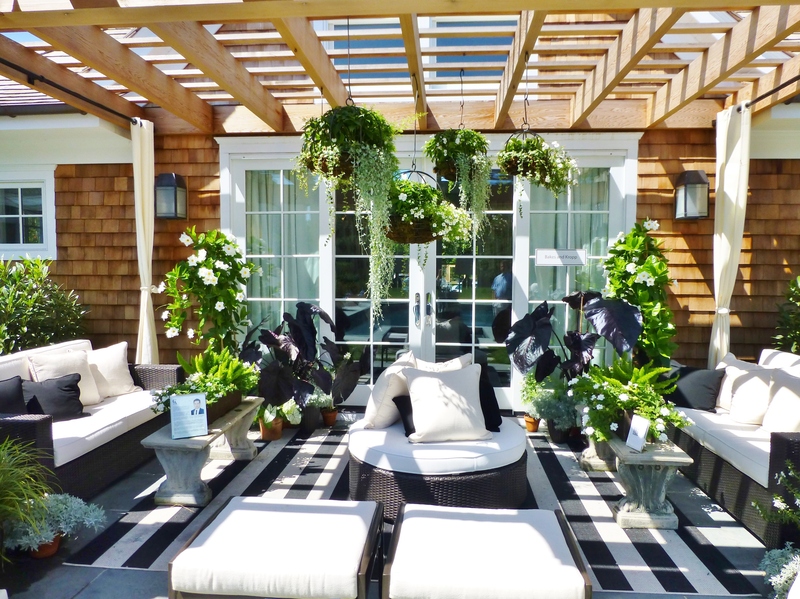 The back of the 2014 Hampton Designer Showhouse, reveals many welcoming entertainment areas. At the far left of the terrace, you can see a small, open but fenced-in, porch. It’s sited to the left of the kitchen’s bay window, and next to the garage. Let’s take a closer look. The ‘Rear Landing’ is located just off the garage. There are also stairs leading down to the lower level here. This is another area designed by Mecox Design Services. Many traditional garden elements were used, like the cement frog statuary on the bluestone steps, and the alligator under the table. A primitive antique vintage Grecian column anchors the corner ahead. My favorite thing about this rear landing area, is the amazing Faux Bois bench. Faux bois (from the French for false wood) refers to the artistic imitation of wood or wood grains in various media. The craft has roots in the Renaissance with trompe-l’œil. Martha Stewart is known for her collection of Faux Bois, and Traditional Home magazine just did a fabulous feature article about Faux Bois artist, Michael Fogg, in a recent issue. This bench is a particularly pretty example with its curved seat and high pointed back. I want one!! Looking back to the right of the image, you can see a wide covered porch with comfortable furnishings and colorful fuscia accessories. Let’s take a closer look. 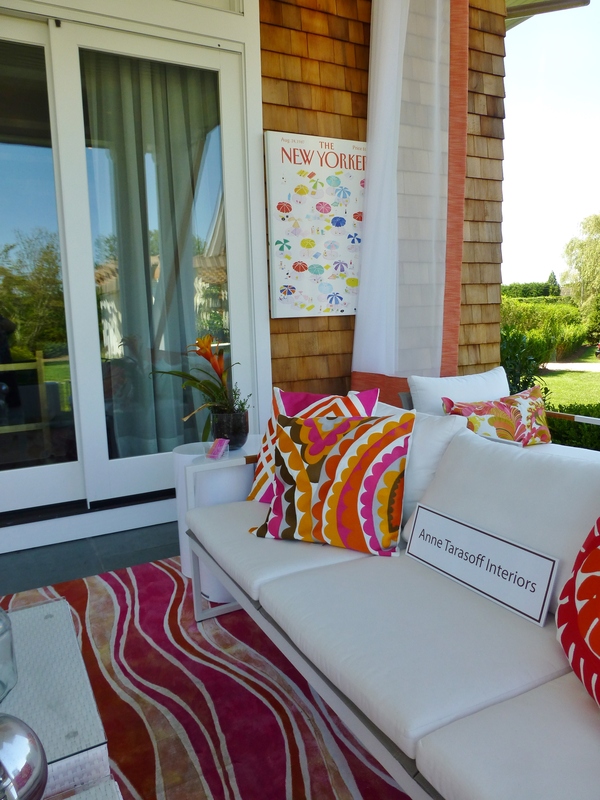 The designers, Gail and Karyn, used bold colorful accessories with crisp white outdoor furniture for this comfy sitting room. Frontgate provided much of the furniture and accessories for this colorful alfresco space. Notice the whispy sheer outdoor draperies…that’s a very nice touch! Now I’d like to take you over to the guest house, just steps away from the terrace. The adorable pool house and guest cottage has an elegant pergola-covered terrace all its own. In fact, it has TWO terraces, at both the front and a rear of the cottage. A pergola covered terrace faces one end of the swimming pool. Caleb Anderson chose to feature a graphic black and white color scheme in his outdoor spaces. I just love how the striped rug visually echoes the slats of the pergola, above. And those potted black Elephant Ears are genius!! 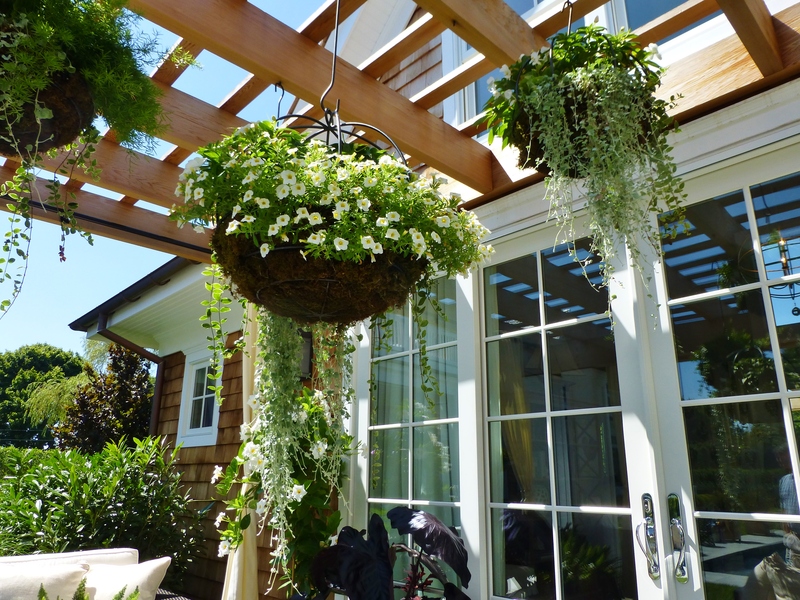 The hanging baskets are planted in moss suspended from wrought iron hooks. 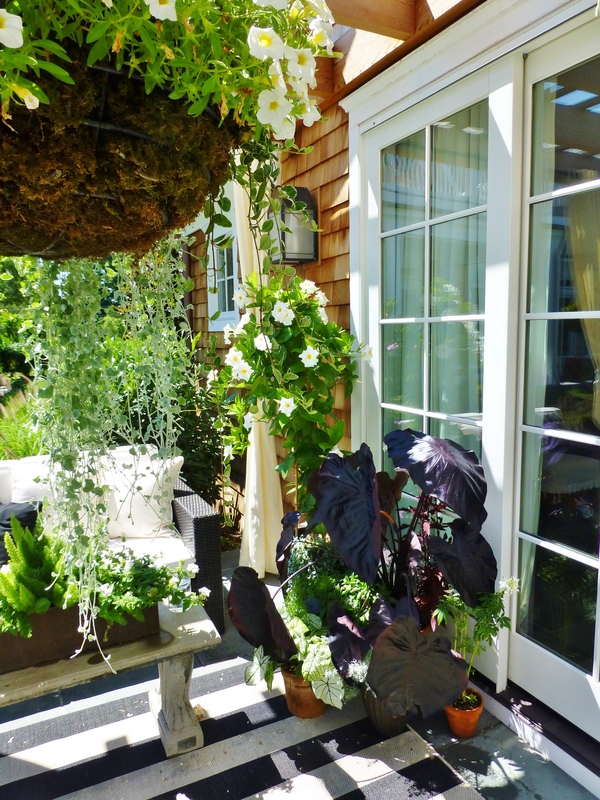 Dripping, trailing plants and small white flowers were used to great effect. These were both understated and opulent at the same time! I also admire how the designer chose to hang them in a central location at varying heights. They are treated almost like a chandelier, placed above the round coffee table ottoman. A detail of clustered potted plants at the end of the outdoor sofa. Notice the traditional cement garden bench used as a coffee table. Very clever! The opposite side of the pool house/guest cottage features a nearly identical terrace. This one features a dining table and chairs, but has the same elegant black and white color scheme and elaborate hanging baskets. Notice the chunky square white columns at the corners of the pergola. The designer placed long white outdoor grommet draperies inside these columns, to soften the look. Well, that’s it for today’s post. What did you think of these amazing outdoor living rooms? Spaces like these are a truly luxurious extension of the interior rooms. This property has an abundance of both indoor and outdoor areas to lounge and be entertained! Next time, we’ll go inside the guest cottage and check out the interiors. Trust me, I could live there full-time! Until then, leave me your comments below–I’d love to get your opinion on the numerous outdoor living areas at the 2014 Hampton Designer Showhouse. Which one was your favorite? 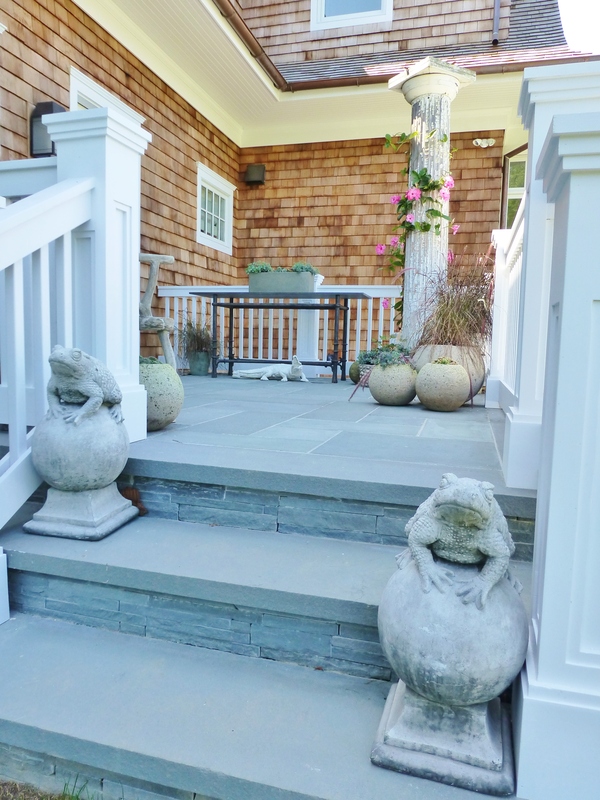 This entry was posted in Designer House, Faux Bois, Garden, Patio, Robinson Interiors, Terrace and tagged 2014 Hampton Designer Showhouse, Anne Tarasoff, Designer House, Draperies, Frontgate, Hamptons, India Hicks, Interior Design, Mecox, Outdoor, Pergola, Pool. Bookmark the permalink.